It's inevitable. If my husband gets sick, I will get sick. Since it's cold season, that's exactly what happened. I came down with a nasty cold and was craving something that had enough flavor for me to maybe taste it and something that was also hot and at least quasi-healthy. So, I settled on Curried Carrot Soup. My cold-induced lethargy prevented me from taking more than one picture but I think the fuzziness of the picture is a wonderful metaphore for how I have been feeling lately. When Rachael Ray made this recipe, it was part of a Halloween Menu, but that didn't stop me from making it in January! Nor did it prevent me from putting the cute little spiderweb on the top. I had to try it out, right? As you can see, there is a reason why I don't do crafty things - I have no talent for it! Timing note: Start the soup then steak dipping sauce. Prepare garlic for shrimp. Cook steak bites and shrimp at the same time, 5 minutes before you eat. Preheat medium pot over medium high heat. Add olive oil, butter, onions and carrots and saute 5 minutes. Add 4 cups chicken stock, curry and cayenne, and about 1 teaspoon salt to the pot. Bring to a boil, cover and cook until carrots are very tender, about 15 minutes. [I skipped this next step and just used by immersion blender instead. Less stuff to clean and it's just good, clean fun.] Place pot on a trivet next to food processor. 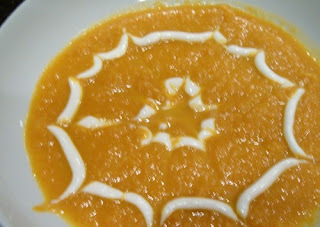 Process soup in 2 or 3 small batches until soup is smooth and carrots are fully pureed. Transfer processed soup into a large bowl as you work to make room for more soup in the food processor. Return completed soup to the soup pot and place back over low heat. If the soup is too thick, add remaining stock, up to 2 cups, to achieve desired consistency. [This is when I look at my husband and say: "What's our desired consistency?"] Adjust seasonings. Is this recipe in one of her books?I love soup and have been looking for a good carrot soup recipe. Home Cook - yep. It's in Get Togethers, page 153. The closest thing I have seen in 365 No Repeats is the Eggplant, Mushroom and Sweet Potato Indian Spiced Stoup. Looks pretty good too! It's at meal 227, page 201. Something for you to look forward to! I have a cold right now and I'm looking for something warm, this curried soup sounds perfect! I made a cranberry ginger tea I found on healthybalance.com and it has enough punch to it to be able to taste. Thanks for the great blog, keep up the good work!